The moon and the emotional sign of Cancer rule your life; as a moonchild your life is strongly affected by the Moon's fluctuations. 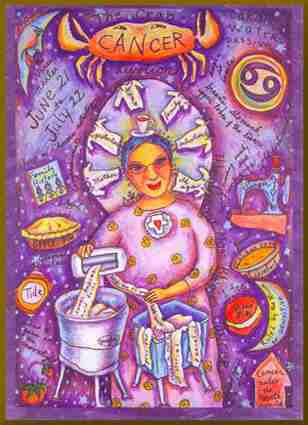 Knowing and using her whereabouts in the belt of the Zodiac is a must for you to succeed in all areas of your existence. Family matters will always play an important part in your life. 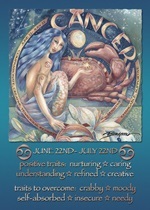 You are classified as the "caretaker" of the Zodiac. Much of your success depends on the awareness and ability to use both the moon and your powerful intuition. You are distinctively gifted with real estate and food (cooking or eating). Lunar children have a solid sense of organization and have inherited strong managerial gifts. You are a perfectionist and are quite critical at times. Plants and green appeals to you, and you tend to worry too much about health to the point of becoming a vegetarian. You will perform very well in a position of power or management. Financial security is important to you and you will shine through your ability to amass riches and possessions i.e., real estate mogul, Ross Perot. You have a gift with children and you have a natural zest to teach them. You must avoid depressing thoughts of the past and keep control over your powerful imagination. Steadiness, organization, warmth, love, and charm belong to you. Your powerful emotions can be channeled positively with music, singing, and the arts in general (country music is a Cancer/July vibration). You are attracted to successful people (older or younger mates) and many Cancerians want to marry rich. Your natural tendency to smother family members and friends at all times makes you admired and deeply loved. You must learn to control your overwhelming sensitivity and participate with life outside of your home a little more. As a rule, all Moon children are great homemakers unless the soul selected a non-domestic masculine Moon before reincarnating on this dense physical world. Like all other water signs, you regenerate in research, science, and metaphysics. You tend to worry too much about your and others' health and you should adopt a more positive spiritual attitude. Learn to let go of the wrong people and move on with life. It is a must for you to respect the Universal Law, as your awareness and moon planning will become a major contribution toward avoiding dramatic experiences and reaching many of your dreams. The location of your natal Dragon's Head or Tail will seriously alter the strengths or weakness of the Moon in your chart.